The Audi A3 offers the versatility of a compact hatchback with seating for five. Power comes from a turbocharged 4-cylinder or a V6 engine. Quattro all-wheel-drive is an option. 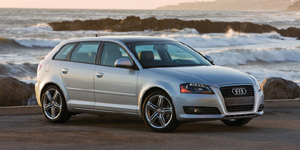 For 2009, Quattro all-wheel-drive is available on 2.0T models. Also optional is Audi Magnetic Ride, which enhances the ride and handling. Leather seat-upholstery, Sirius satellite radio, a leather steering-wheel, auxiliary audio input, and hill-hold assist come standard for 2009, as do Bluetooth, bi-xenon headlights, Open Sky sunroof, Concert CD audio, Sport Suspension, and Sport Seats on V6 models.